Kichisen is one of the best Kyoto-Kaiseki in Kyoto, awarded 3 stars on Michelin Guide 2015. it is close to theworld heritage site Shimogamo-jinja shrine. Walked along the main street in the area, and we saw an attendant stand by the main gate of the restaurant who is waiting for the guests. We felt the warmest welcome from the restaurant at this point. The restaurant mainly consists of private rooms, the only room for counter seats is just by the main entrance. (next to the paiting). There are only 5 seats at the counter. Kichisen was only awarded Michelin 3 stars, it was also among the TOP 500 List, and won the Best Restaurant Award from Tabelog. I was serverd with hotel towel in a cute bamboo basket and a black box of ....(treasure?) with a bamboo stick, seems like food HAHA. It's a welcome dessert, purple sweet potato yōkan [紫芋の羊羹]. Yōkan is a traditional Japanese dessert, the texture is more like jelly pudding. Japanese make the yōkan in different flavors in different seasons, such as yuzu and chestnut yōkan in autumn, sakura yōkan in spring. A cup of hot Matcha after the dessert. Matcha is also one of the specilities in Kyoto, this cup of matcha is one of the best i have ever had. Very strong and original matcha flavor, the temperature is perfect as well. I was told to pick up the pottery first, and the chef helped me with some welcome sake. After that, the real feast begins. Simply mixed crab meat with the matcha tofu, the ponzu in the tofu dish works perfectly with the matcha flavor tofu and crab meat. The crab is really firm, juicy and sweet. I am an Anago(sea eel) lover, actually all kinds of eel lover. The chef is so creative to make the Anago into mousse, the texture of the Anago mousse is really creamy and melted in my mouth, with delicate Anago flavor. It makes the simple soup so delicious. Sashimi [ Mukōzuke 向付] Consists of Otoro (Fatty tuna), Ika (squid), Tai (Sea Bream). The otoro is creamy and oily, but not greasy. It heavenly melted in my mouth in a second. A shift [凌ぎ] red bean and chestnut rice 栗蒸しおこわ served ina cute bamboo kit of with some sesame salt on the top. The rice is perfectly steamed to chewy and fat, the chestnut of the top is so creamy (yes, creamy!) and sweet, which made the whole kit gorgeous. The sesame salt to me is interesting, because i think food made of red bean and chestnut should be sweet, while the addition of the salty to the dish made a nice balance. I couldn't believe that i was eating a radish! The radish i used to have all have fibres inside, while this one was not. It is smooth, really creamy, just like eating mousse cakes. The yuzu makes the smell and taste perfect. It is the best radish ever in my life. The next dish was in such a beautiful presentation. Cannot wait to see what's inside. Grilled dish [Yakimono 焼物] was trout grilled on a thin slice of pineapple on a hot stone. I love the idea of grilled the trout on the pineapple sheet, which brought a freshness to the dish. The grilled dish comes with a small green salad, with yuzu avocado sauce on the bottom. I was told to have the fish with the salad, simply mixed everything with the avocado sauce. I liked this dish very much, especially the citrus avocado sauce on the bottom. Avocado should be creamy and sometimes greasy, but the combination with the citrus made the tastes a bit sour and very fresh. The trout itself was very tender with a touch of pineapple taste. Unlike the rice in other Japanese restaurants, which every single rice is like pearl and chewy. The version here is more like crispy rice puff, or maybe rice crust, with a awesome taste of burned. The rice was served with some clear soup and a grilled mochi (rice cake). The burnt smell of the mochi is so great, it is chewy and sticky.Love this special rice dish so much. Dessert [Mizumono 水物] There's always room for dessert. A 100% sweetness (完熟) Japanese Orange? 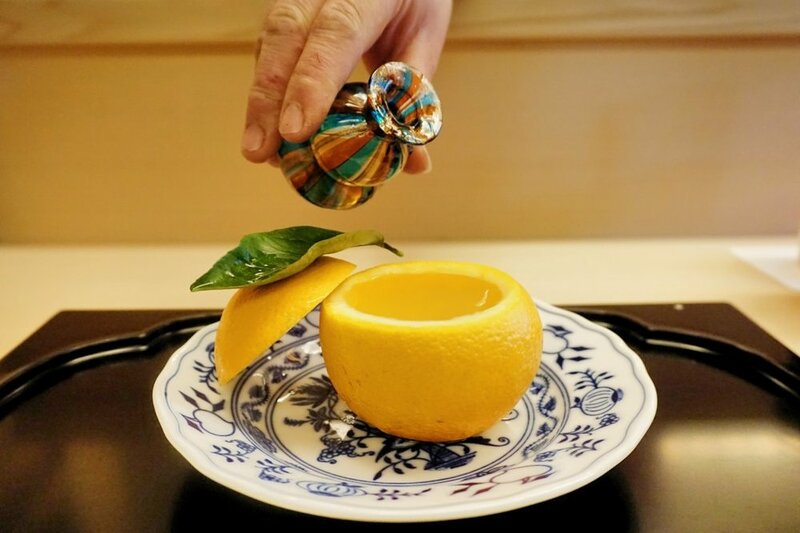 it is actually a cold Yuzu Jelly served in an orange, i was toldto try the jelly on its' own first, then the attendant add a few drops of apple liquer, and finally squeeze the orange juice from the top half over the remaining jelly. The orange is so sweet, certainly not the artifical sweetness. A cup of Hojicha to end up. Hojicha is a kind of tea that is pan fried, and then cooked. So the smell of Hojicha is really good. The service is really good here, the chef can speak a little bit English and we talked a lot with him, he is really friendly.The resuautant made us feel that the guests are really welcomed, especially oversea guests like us, such the reservation can be made oversea by email or phone. The price is much more friendly compare to the other Kaiseki restaurants in Kyoto. Overall, the dining experience at Kichisen is perfect, gorgeous food and ambiance. Really worth a visit!